Trid – City Guide is Android app template show interesting place from a city with description and some attribute. 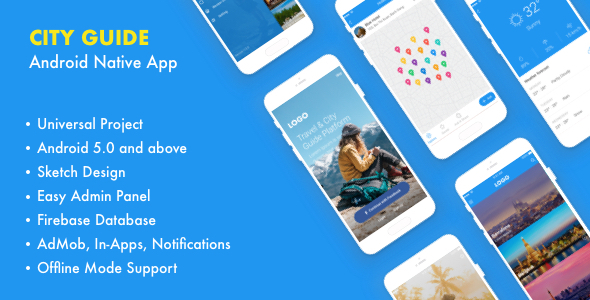 With this template, you can create your own City Guide App with Points of Interest group by categories (See, Do, Eat, Drink, Nightlife, Sleep, Tour…). Develop with Android Java/XML language makes the app run smooth and fast. All data stored in Google FireBase database so the app works in online and offline mode. The design is simple by Sketch Tools. An astute user experience is subtle, beautiful and intuitive. Offline Mode: Maps and contents can be used without an Internet connection. Weather Included: 14 days weather forecast with offline mode in each city. Ask Questions: Users can create a question or share a tip in each city. Save Favorite Places: A place can be saved to favorite to be seen later. Search: Users can search places easily. Filter: The places list can filter by subcategory, price. Sort: Places, Categories, Cities can sort by handpicking in Admin page. Ratings and Reviews: Users can rate and review places. User Login: Users can log in via Facebook or by email/password. Map View: View places in vicinity and search places in the area. In-App Purchase: The user can buy in-app to unlock the city. Push Notifications: Includes firebase push notifications. Side Navigation Menu: Easy navigation through the side drawer. Firebase: The template has firebase to track the user behavior. Admin Page: A powerful admin page to manage, edit, create cities, places, categories, manage users and much more. App Rating Feature: The app asks the user to rate the app after 5 clicks to make it easier for users to give you a good rating. Affiliate Banner Ads: You can create banner ads for each city and category in Admin page. Earn money from Ads Affiliate. Hotel, Tour Affiliate: You can create a place is Hotel and Tour, put link booking affiliate to earn money. Responsive: Works on any model of this family of Android devices. Sketch Design: Sketch file and icons included in the package. This entry was posted in android, mobile, templates and tagged affiliate, android, app, city, gps, guide, ios, maps, navigation, offline, travel, weather by dadmin. Bookmark the permalink.